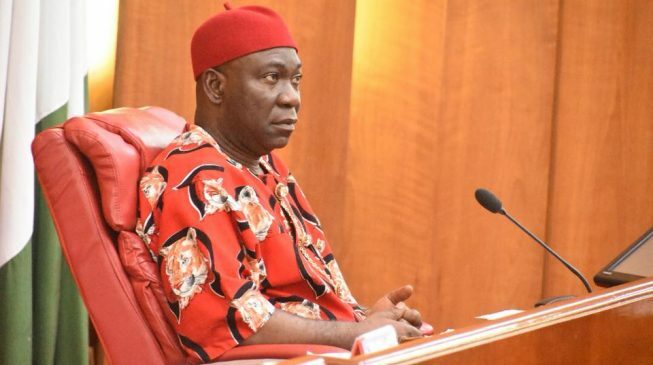 Ike Ekweremadu, Deputy Senate Chairman, is fighting with Southeast European leaders to support the election of Peter Obi as Vice-President candidate of the People's Democratic Party (PDP), according to TheCable. Both men were top favorites that Atiku Abubakar considered as a runner-up in the 2019 presidential election, with Obi getting the nod. However, the southeastern political leaders, consisting of the PDP governors, the National Assembly, the Board of Trustees and other party leaders, rose from a meeting on Saturday and complained that they were not interviewed about Obi, a former Governor of Anambra State. An insider at the meeting said that Ekweremadu asked outraged leaders to calm down and support the election of Obi, who was better received outside the South East than by his own constituency. "Ekweremadu has reminded us that the main task now is to bring the PDP back to power and save the country from its downward spiral," said a party leader who attended the meeting, TheCable. "He even joked that it did not matter if Atiku chose a Northerner as his runner-up, as long as it brought the repressive government of Buhari out of power." Although the meeting was convened to reject Obi's nomination, the southeastern leaders were reportedly shocked by Ekweremadu's position. We thought we were going to fight for him, but he said we should allow Obi, we were shocked by his athleticism, "the insider said. According to insiders, the biggest chagrin of the leaders was that Atiku had not asked for their contribution to the decision. Among the contemplated were Ekweremadu, Obi, Ngozi Okonjo-Iweala, Osita Chidoka and Austin Akobundu, a retired colonel and national PDP PDP secretary. Mustafa Chike-Obi, former MD of AMCON, has not made the final shortlist, unlike a previous report by TheCable. Nyesom Wike, governor of the state of Rivers, is said to have supported Obi to criticize Southeast Europeans for failing to ask his candidate Aminu Waziri Tambuwal for the presidential ticket. The southeast of the country was reportedly elected at the PDP conference for Atiku. The southeastern leaders favored Ekweremadu due to his wide experience as former Council President, former Secretary of the Government of the State of Enugu and deputy biennial Senate Chairman. Leaders of the geo-political zone are expected to report their complaints to Atiku at a meeting scheduled for the week.